Here are four insights we discussed regarding business valuation; and mergers and acquisition. The purpose of the business valuation will play a significant role in what valuation method will be used and how components of the particular method are applied. For this reason when a business owner hires a valuation expert to perform a business valuation, the contract and valuation clearly state the purpose and that this valuation may not be use for any other reason. Be clear on what the purpose is for your business valuation and don’t be surprised if you need to have separate valuations for separate purposes. It is in your best interest. There are many business valuation methods, each tailored for a specific type of valuation. Here is a list of the some of the valuation approaches. Usually the preferred method is the Public Company Comparables or Market Approach. In this approach, the business being valuated is compared to a publicly traded company of comparable size and industry. This will be the basis of the valuation. This approach is preferred because the market has already placed a value on the comparable business. The problem with this approach is that it can be very difficult to find a comparable public company. For this reason, other valuation approaches are used. While we spoke of several different valuation models in our financial coaching session, in this article I will explain one of the more common approaches. EBITDA stands for Earnings (net income), Before, Interest, Taxes, Depreciation, and Amortization. It is calculated by taking earnings and adding back to it the interest, tax, depreciation, and amortization expenses. This is the valuation formula. Here is a sample calculation. EBITDA is fairly simple to get from your financial statements. Talk to your bookkeeper or CPA for that number. 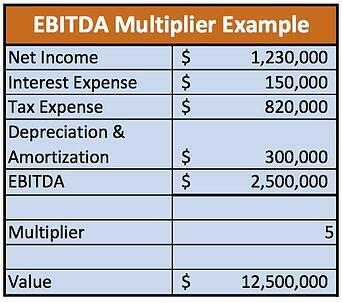 Once EBITDA is calculated, the multiplier must be selected. The multiplier varies widely depending on various factors. These can include availability of capital, industry, size of the company itself, expected growth of the market and of the business, ease of transfer of ownership, overall efficiency of the business model, etc. We regularly see multipliers from four to eight, and sometimes more. The best way to figure out what this would be for your type of business is from historical sales data for similar business sales. This information is usually obtained from a business broker or a CPA with a merger and acquisition specialty. With so many business valuation approaches, business owners should consult with a valuation professional to find the right valuation method for their specific purpose. In any business, there may be expenses that are not directly linked to the core business. A business may also be using cash accounting rather than accrual accounting. Adjusting for these types of expenses and accounting methods will provide you a better and a more accurate valuation of your business. Accounting methods used by the company that do not reflect economic reality. For example, the accrual accounting method is more accurate in reflecting economic reality than the cash accounting method. It is highly recommended if a business is using a cash accounting method that the business switch over to accrual accounting around three years before the desired start of actively seeking to sell the business. A problem in doing expense recast adjustments is going back to remember all these expenses. With some of our clients we do this through what we call a normalization log. On a quarterly or semi-annually basis, we help our client list all the expenses that would potentially be adjusted for a business sale valuation. Even though it may be a year or more till the company is ready to start the sale process, by keep track of these expenses, the business owners will be ready to get the most favorable and accurate valuation possible. More importantly you want to capture the facts and compelling story why each particular adjustment qualifies for recasting. It helps to use an exhaustive tickler list of possible recast adjustments to do this exercise. Keep a list of expenses that do not reflect core-earning capacity. This includes lawsuits, discontinued operations, management or shareholder bonuses, non-market rents, etc. Here is a list of items help you start with your list. What would a buyer want to know about your company? Where are your contracts? Are they transferable? You want to go into negotiations with all your business information readily available for the buyer. This high level of organization will show the potential buyer that the business is in order and will aid in building the buyer’s confidence in you that you are not trying to hide anything. The reality is, when a buyer is surprised in the due diligence process by an unexpected finding he will loose confidence in the seller and will wonder what else has not been disclosed. This typically results in a change in price and/or terms. Always assume they will find it. If you think you are going to be able to hide it, you are wrong. Get your business information organized. If necessary, get those items you would rather hide cleaned up or put it out on the negotiation table. As mentioned, this was our last Financial Coaching to Survive & Thrive session for the year. We are planning to start up again the six session series in May 2015. We hope you can join us then. If you have any questions please comment below or reach out to us.